You may not be familiar with the French word Réfractaire, at least as it was coined during the Second World War. It has no direct English translation and, due to the manner in which the war played out, no real English equivalent, something for which our forebears who lived through those times are no doubt grateful. Réfractaire was a name given to – and eventually embraced by – citizens of occupied France and Luxembourg who "actively avoid the compulsory draft of being sent to undertake civilian work in Germany. "* Unlike the Resistance, they did not take up arms against the invaders (although many réfractaires subsequently joined the Resistance), but instead went into hiding or lived under false identities to avoid conscription. None of which I was aware of until I sat down in front of Nicolas Steil's film about life as a réfractaire during WW2 Luxembourg. He even titled his film Réfractaire for us to make the connection, despite providing no textual preamble explaining its use and meaning. Except in the UK it's been released as The Undercover War and given DVD cover artwork that could not be more misrepresentative of the story, content or tone of the film it is selling. You can see the cover in question in the sidebar to the right – where the hell that picture is from is anybody's guess, but it features fighter planes, a tank, troops under fire, and the rear view of what looks like the helmeted head of a US Marine, none of which appear in the film itself. There are no battle scenes, no troops, no war machinery of any kind and only a couple of shots fired, and even they are from off screen. Set in occupied Luxembourg in 1944, the film follows the fortunes of college boy François, the student son of a bourgeois engineer. 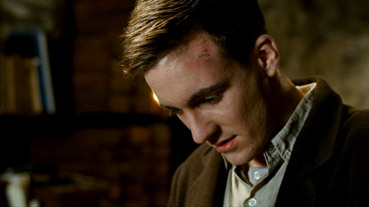 Unlike his bullying father, François refuses to cooperate with the Nazi invaders or accept their new teachings and instead joins a group of like-minded réfractaires at a secret hideout in a disused quarter of a nearby mine. Now right here is where those seduced by the prospect of the slam-bang war actioner promised by that cover are likely to start shifting in their seats. 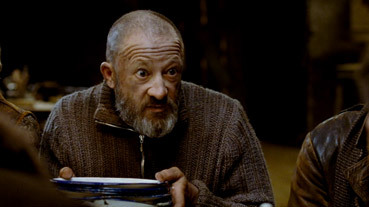 Once François is underground, the film settles down to focus on the details of day-to-day living in the mine where he must now remain for an indefinite period, permanently starved of fresh air and sunlight and required to endure the most primitive conditions in the company of those that view him with open distrust. And it's no use waiting for the big action scene shown on that cover because it never comes. It's not that sort of film. Indeed, it's the sort of film whose target audience may well not give a disc bearing that cover a second look. Oops. What it does capture well is the glum living conditions and social isolation of underground life, a self-imposed prison with the most basic of facilities (the only toilet is a bucket of collected condensation water and crockery is washed with sand) where there is nowhere to go and little to keep you occupied and prevent you from going stir crazy. It is here that the film is at its most quietly effective, as the camera drifts between the occupants as they engage in their individual efforts to keep boredom in check, whether it be reading, playing cards or carving sculptures from wood. Meals are concocted from whatever can be smuggled to them, and many are fighting a battle against the diseases exacerbated by the unhygienic conditions and the lack of sunlight. But a drama-documentary this is not, and in the name of narrative cinema François is required to undergo a developmental journey, one that the opening scene image of him lying on the ground bloodied and beaten suggests will not end well. It's here that the film walks on more traditional ground, particularly in the make-up of the underground group, almost all of whom have a specific role to play in François' evolution from bourgeois group misfit to committed réfractaire, which is symbolised in the gradual change in his clothing, from clean suit and tie to scruffier and more practical underground attire. It doesn't help that his love rival René is there as well, but there are also physical warnings in the shape of gruff, gun-happy hard-liner Jacques, who takes an instant dislike to François that you just know is going to lead to conflict, and the unfortunate Armand, who has been underground long enough to have suffered a complete mental breakdown. Others fulfil their narrative function by allowing François to prove himself in times of greatest distrust or provide him with information that will prompt him to action, while his involvement with lonely collaborator's wife Malou on his risky night-time trips into the town seems to be heading for trouble from the moment it starts. But not all plays out as expected. No-nonsense communist group leader Pierrot may be quick to threaten François about his conflict with René but is not so easily persuaded by later claims that François has betrayed him, and his dinner-table speech about the importance of unity and a knowledgeable proletariat is delivered with persuasive conviction. The hard-nosed Jacques plays much to expectations, but his story still concludes in an unexpected manner, and even René's secretive nocturnal excursions prove to have importance far beyond paying his girlfriend a visit. There are similar surprises in the sub-story detail – that a drunken François accidentally starts a fire while trapped in Malou's cellar, as she and her husband argue in the room above, feels a little like one of those badly timed mishaps that always seems to happen in films, but you're still caught out when the fire burns out of its own accord and causes no-one any harm. It's a consistently low-key affair, which befits a story based around hiding and secrecy, something also reflected in the pacing and the nicely understated performances from the supporting cast. Where this approach comes close to backfiring is in leading man Grégoire Leprince-Ringuet, who plays François with a minimal degree of emotional expression. This does make connection with his character a gradual rather than instant process, and one made through familiarity and experience rather than direct engagement. It does, however, put a subtle but effective social distance between François and his fellow mine dwellers on their first encounter and thus makes it possible to be quietly amused by their mockery – "Would the honourable son of a bourgeois mind doing the washing up for these sons of proles?" asks Jacques with false humility before handing him a pile of dinner plates. Like the recent Army of Crime (in which Grégoire Leprince-Ringuet also appeared), the production of Réfractaire appears to have been driven by the desire to bring untold WW2 stories to a wider international audience. It's a laudable ambition that is doubtless responsible for the narrative safety-play, but even the recycled elements are handled with a deftness and attention to detail that steer them safely wide of the clichés they might otherwise become. And while not the sort of film you find yourself shouting about from the rafters, this is still an involving and nuanced drama that aims to widen appreciation of what the real life réfractaires went through in the name of non-cooperation with enemy forces. If those who do see it can just persuade others to ignore that misleading cover and give it a try, then it might just succeed. A punchy and well balanced 1.78:1 anamorphic transfer whose contrast, colour reproduction and sharpness are all of a high standard. 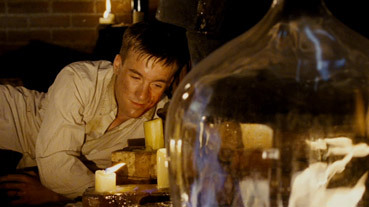 The film's low-key approach is reflected in Denis Jutzeler's cinematography, which follows a current period film trend of favouring earthy hues for daylight and the artificially lit underground and cold blues in the night-time exteriors. The light levels are generally low without sacrificing detail or washing out the black levels. Only the densely detailed woodland wide shots produced visible jaggies when upscaled to a large TV. The Dolby 2.0 stereo and 5.1 surround tracks are sonically similar and of identical volume, but the 5.1 is inevitably more inclusive, with the acoustics of the mine and the surrounding forest nicely captured. There is also some precise location of sound effects here, and engine sounds given a throaty bass kick. The music and crowd atmospherics of the open air dance are well recorded and mixed. Rather than the usual collection of behind-the-scenes featurettes and interviews with actors, two of the four extras here focussed on those actual veterans of the occupation of Luxembourg. All four extras are labelled as interviews, but the third is a post-screening Q&A. Interview 1 (21:03) is with Aloyse Raths, a former teacher who in 1940 founded the Luxembourgish Legion, in the following year was co-founder of the Luxembourgish People's Legion, and from 1967-2004 was president of the National Council of the Resistance. Raths recalls the arrival of the Nazis in Luxembourg and how drastically things changed once they established their presence, painting a vivid picture of the fear and distrust that spread under Nazi rule. He describes how and why he went about starting the Luxembourgish Legion and how they transported those who were threatened with conscription into hiding. The most fascinating story, and one worthy of being immortalised on film, covers his own arrest and interrogation, and how a seemingly unlikely chance event allowed him to beat the charge. Interview 2 (35:29) is with Aby Mergen, a Réfractaire who spent seven months hidden in the Hobdsbesch mine in Niederkorn and who is interviewed sitting next to Aloyse Raths in the same location as the above. Mergen describes how preparations for taking him into hiding were made by his family without his knowledge, how he narrowly escaped being shot alongside others, and the process that eventually led to him being transported to the mine. His description of the conditions below ground suggests that the portrayal in the film is pretty much on the nose, and the stories of body lice should have everyone fidgeting. A compelling and important testimony. Interview 3 (9:22), as mentioned above, is actually a Q&A with director Nicholas Steil following a screening for WW2 Luxembourg veterans, who react positively to the film and Steil's desire to bring the story to an international audience. As a side note, when Steil says the 'Réfractaire' in relation to the film's title, the subtitles claim he said 'The Undercover War', presumably under the impression that we can't hear him speaking. Interview 4 (19:03) is with producer and director Steil, who talks about his attraction to the subject matter, the stories told to him by his mother of life under Nazi rule, his increasing uncertainty about how he would have reacted in this situation, and the slow process of bringing this film to fruition. The background research is covered in some detail, and it's here that I discovered that the underground scenes were filmed in a real mine, a decision that was not without its problems and dangers. His reasons for making the film are also outlined here. Despite the familiarity of some of the story elements, this is quietly absorbing and enlightening film that deserves to be more widely seen than it probably will be (for the record, the original title is still on the transfer here – The Undercover War appears on the packaging only). What really sells the disc are the interviews with the two veterans, whose stories of life under Nazi occupation really compliment the film and are valuable documents in themselves.